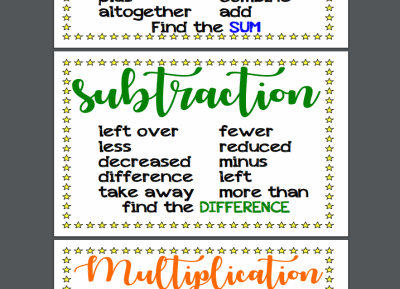 This set of 4 word problem key word posters shows students which words to look for to decide which operation to use; addition, subtraction, multiplication, or division. One poster for each operation is in this set of full page letter size posters. 2 comments about this printable. How do I get this poster? Simply download the PDF file and print the pages you wish to have.